Businesses love it when you sign up for automatic payment. You can’t forget to send them their money, although you do have to make sure you have enough money in your account. I absolutely hate it, which is why with the exception of my car loan (which I received an interest rate reduction in exchange for signing up for automatic payments) I have ZERO automatic payments extracted from my bank account. Automatic payments, or subscription auto renewals, are also a way that businesses get you to pay for services that you may not want any or need anymore simply because you forget to cancel them. I had to relearn this lesson the hard way recently. A few months ago, my son asked if he could try out a gamer network. It costs $6.95 per month to be a part of the network. He gave me $7 for a month’s subscription, and I set up an account, and entered in the information for the fee to be paid for out of my PayPal account. After a few weeks he told me the network wasn’t what he expected and that I could cancel the account. Who has two thumbs and forgot to cancel the service? Yeah, that would be this guy. I was reconciling the checkbook recently when I saw a $6.95 charge from PayPal. Looking into the charge more carefully I figured out what it was for, slapped my forehead and cancelled the service. I looked at my history and found that I had paid for a total of three extra months of the service after my son had indicated that I could cancel it. Thinking back, I remembered seeing the charges in past months too, but chalked it up to other games he was buying and giving me money for. I shook my head, and thought to myself that this is another reason why it would be great for my son to have his own debit card, and be responsible for his own payments for games. I prefer to make my payments manually. Mortgage payments, utility payments, garbage payments and countless others can all be setup to be automatically deducted from your checking account. But I like to be the one that initiates the transaction. It helps me pay more attention to when bills are due, and how much they are. When my bill payments are on autopilot, my brain tends to go on autopilot. This is a great illustration of the result of how that works out for me. 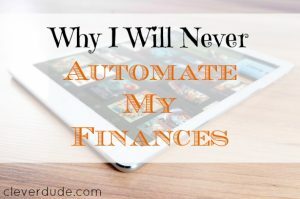 Do you automate your finances? How does it work out for you? Have you ever paid for services you didn’t want anymore because the subscription auto-renewed? 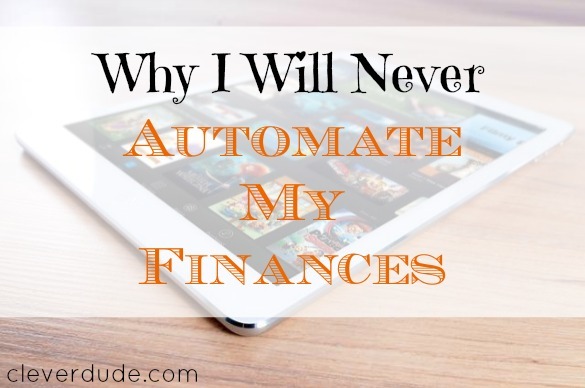 I prefer to automate my finances for essential things such as utility bills and insurances. This way I won’t forget to pay them and save my time as well. I sometimes automate the payment for things that are purely entertainment. I keep an eye on them and stop my subscription immediately if I don’t think I will need them any longer. A few years back we went on vacation to Alaska for a month so I automated a lot of my bills so I wouldn’t forget or be late paying. I liked it so much I just kept them on auto pay when we returned home and still am happy with it. We get our pension once a month so we know the money will be there without juggling a couple of paydays or deciding what bill gets paid out of which paycheck. Works for us. Utility bills, mortgage payments, things like that I’m fine with. But items like magazine subscriptions, etc. I will not do. I guess in my mind I’ve separated them into the categories of things that I know how much they’ll cost (OK) versus things that will probably go up in price the second I forget about it (not OK). This is why I don’t do auto-pay either. I have 3 things that auto-pay each month: student loan (interest reduction for setting it up), my gym membership (which I do use religiously and discount for setting it up), car insurance (discount for setting it up). Like you, I have to initate it myself so I remember how much it was and when it was due. @poorstudent – my problem with automating things that are important are that I’m trusting an electronic system to make sure a payment is made. I sit down and review my finances several times a week…..and I trust myself waaay more than some automated system. But, different people do have different perspectives – whatever makes you feel most comfortable -thanks for sharing your thoughts! @Kayla – oooh, I have to admit, I forgot about auto insurance. That’s automated as well – but like my car loan, it’s because I get a discount for having it done electronically. @Sarah – We have netflix too, well, I should say that my son has netflix. he has to pay for it, so it’s his responsibility to cancel it if he doesn’t want it. Otherwise I keep collecting the $6.95 each month when it gets posted to my account. 🙂 thanks for dropping by! 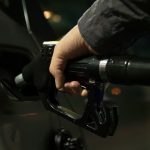 You do need to really review those recurring charges – a few times I did some digging and found I could be saving money because new plans were offered (cell phone for example) but I was not aware. @May- I think you hit the nail on the head…even if you automate your payments, you shouldn’t put your mind on cruise control. You still need to check over the bill, ensure the payment was made, and reconcile the payment in your account tracking. It may help a person ensure the payment is made on time, but it would still requires a person to be active and double check everything is going as it should. Thanks for sharing your experience!